In a latest announcement, BlackBerry has introduced its much anticipated Z30 smartphone with the largest touchscreen in any BlackBerry till date. The Z30 comes with BlackBerry OS 10.2 out of the box. Announced in the times when company’s future is hanging in bargain what could be a possible sale of the company, this launch is a glimmer of hope for the BlackBerry enthusiasts and the investors. The BlackBerry Z30 has a 5" Super AMOLED display with a resolution of 1280 x 720 pixels with pixel density at 295 PPI. The Z30 is powered by a dual-core 1.7GHz Snapdragon S4 Pro chipset and 2GB of RAM. It is bundled with a 2,880 mAh battery. The dimensions are 140.7 x 72 x 9.4mm. The BlackBerry Z30 supports LTE as well as dual-band Wi-Fi 802.11 a/b/g/n, Bluetooth 4.0 and NFC. BlackBerry Z30 has an 8MP camera with an f/2.2 lens and 1080p video recording while the front camera is 2MP and supports 720p video. BB 10 OS version 10.2 is out of the box which brings some improvements to the BlackBerry ecosystem including BB Priority Hub, message previews in the lock screen as well as Wi-Fi Direct support, multiple alarms. BB OS 10.2 will be out for Q10 and Z10 users by mid of October but there might be some delays, which would be due to carrier approval of the update. BlackBerry hasn't specified any pricing or availability information just yet, but the Z30 is expected to hit the UK as early as next week. In addition to its stunning 5” touchscreen the BlackBerry Z30 10 with OS version 10.2 is packed with new features designed to enhance the BlackBerry 10 experience. A promo video showing off the device and a rundown of the best new features in the BlackBerry Z30. BlackBerry 10.2 OS includes hundreds of refinements plus many new features that help you be more productive. BlackBerry Priority Hub – The new BlackBerry Priority Hub is now smarted than ever. It can now learn what conversations and what people are important to you and it makes it fast and easy to find the messages and information you need. It collects the priority messages across your email, social networking and other accounts and gives you instant access to the conversations most important to you to help you stay organized and focused on the most important tasks. BBM Now in Any App and Message Previews Everywhere – Users can now get a preview of any message as it arrives in whatever app they’re in, and immediately dismiss it or tap it to read the full content and respond. If a BBM message arrives, user can instantly reply to the message without even leaving the app you’re in. In addition, if your phone is locked, you can tap the various icons on the Lock Screen to see an instant preview of your most recent messages and notifications. Better Connectivity – The Z30 features BlackBerry’s new generation antenna technology that dynamically tunes reception to give user a better connectivity in low signal areas. BlackBerry Paratek Antenna is designed to give user the faster data transfers and fewer dropped calls in low signal areas, keeping them connected in more places. Large Battery – The Z30 includes a 2880 mAh battery which is the largest battery ever for any BlackBerry handset. The Z30 is expected to provide up to 25 hours of backup to keep you moving. The BlackBerry Z30 will roll out from select carriers and retailers around the world beginning next week in the UK and Middle East, and all other regions going into the holiday season. There is no word on the pricing yet and it will be announced by partners at the time of their respective launches. No doubt the pricing would be the biggest factor for Z30’s success, if BlackBerry is looking to revive, they need to price it smartly as the recently launched Note III and iPhone 5C and 5S are priced too damn high. After the carrier approvals, BlackBerry 10.2 is expected to be available for the BlackBerry Z10, BlackBerry Q10 and BlackBerry Q5 smartphones beginning mid-October. 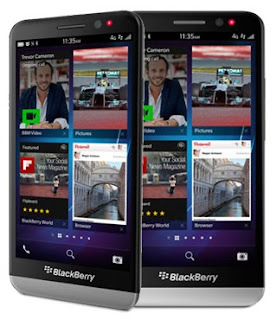 For more information, follow the link BlackBerry Z30 website.